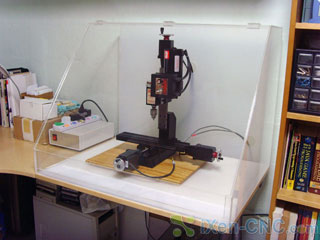 Homemade accordian-style Y-axis leadscrew cover and clear acrylic CNC mill enclosure by iXen-CNC - Millhill Supplies Ltd.
Sherline may offer these someday, but for now you can make your own thanks to very well done plans and videos you can find on the Internet at http://www.ixen-cnc.com/. The Y-axis has the only exposed leadscrew on the Sherline mill. CNC milling generates a lot of chips, and the machine is often run unattended, allowing chips to build up on the leadscrew where they can be drawn into and embedded in the backlash nut. To make sure this doesn’t happen, operators often cover their Y leadscrew with a piece of scrap cardboard or paper. The neat accordian fold flexible protector is shown on the web site looks and works like those often found on full-size CNC machines. Links allow you to print out the pattern and fold one yourself. A video link shows you how. If you operate your CNC machine in a home or lab environment, keeping the surrounding area clean is a priority. This acrylic enclosure will do the job just fine and is something you can make yourself it you are good at cutting and gluing plastic sheet. If you aren’t able to cut the sheets yourself, you can probably have your local plastic supplier cut them for you using the cut list on the plans provided. Instead of the bottom you might consider using a large metal cookie sheet or metal garage drip pan. Holes can be provided for an inlet and outlet hose running to a coolant reservoir and aquarium-type pump if you cut your parts using coolant. 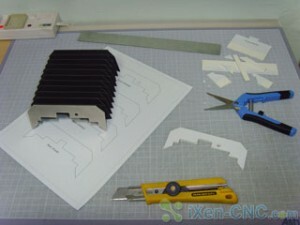 Our thanks to iXen-CNC.com for coming up with these excellent plans and posting them on the Internet.